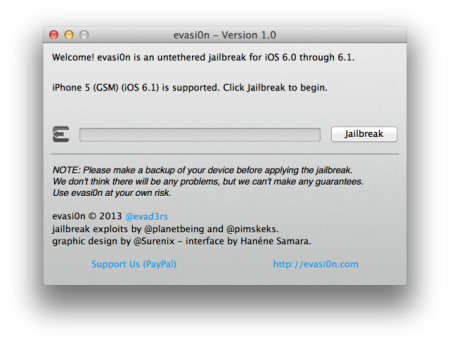 Finally, evasi0n, the untethered jailbreak for iOS 6.x devices is here, meaning you can reboot your phone just like you normally would after the jailbreak. As always, backup your data via iCloud over-the-air, or via iTunes in case something goes wrong. Tested evasi0n on Mac OSX 10.8 with no problems. iPhone 5 (GSM) jailbroken in less than 5mins. Downloading packages from Cydia remains a challenge at this point due to sudden uptake in traffic. Tried to install SBSettings a couple of times but is getting timeouts on certain packages. Guides for using evasi0n from iClarified and ModMyi. Credits to evad3rs team for making this jailbreak possible!